The Sony Xperia M2 joins the Sony Xperia Z2 as the smartphone line-up for Sony at MWC 2014. It comes with a smaller screen than it's bigger brother at 4.8-inch but manages to beat screen estate on the Sony Xperia Z1 Compact coming in at 4.3-inch. What else does the Xperia M2 offer? T3 went hands-on to find out more. Article continues after the video. From the off, you'd be forgiven for mistaking the Xperia M2 for the Xperia Z2 as they look almost identical. Both feature the signature Sony design of a glass back and aluminium sides and the iconic Sony on/off button. Physical buttons are kept to a minimum with only a volume rocker and a shutter button on the sides. 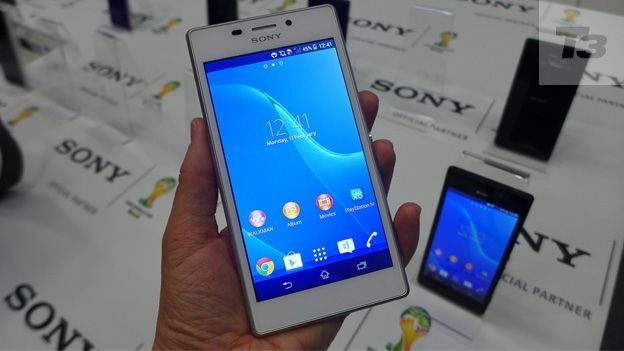 Vital stats are 139.6 x 71.1 x 8.6mm and according to Sony, those make it the slimmest 4G smartphone to date. Compared to the likes of the HTC One Mini and the Samsung Galaxy S4 Mini, the design of the Xperia M2 is premium, there's no plastic and it feels solid and reassuringly weighty. So,what makes the M2 mid-range? It's the camera. At 8MP it's a much smaller sensor than the Z2 at 20.7MP. There's no 4K and there are less features within the camera. Slo-mo and background de-focus are a no-go. Having said that, it's a decent enough camera and can certainly compete with it's mid-range competitors. As with the Galaxy S4 Mini the OS of choice is Android 4.3 Jellybean so don't expect any KitKat action any time soon. At 4.8-inches the screen on the Xperia M2 isn't small but don't expect the same tech as on the Z2. At 540 x 960 pixel resolution it's not the sharpest of screens and side-by-side with it's high-end brother the difference is certainly noticeable. On to the battery and it's quoted at up to 14 hours talk time and 8 hours video playback thanks to the 2300mAh unit inside. Of course, we'll check this with the full review but on paper it looks pretty impressive and one of the stand-out features on the Xperia M2.